Hiroaki Kobayashi is currently Professor and Chair of Computer and Mathematical Sciences Department, Graduate School of Information Sciences, Tohoku University. In 1995, 1997-1998 and 2001-2002, he was Visiting Associate Professor of Stanford University (EE department and Computer Systems Lab.) . 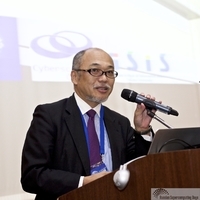 In 2008-2016, he was Director of Cyberscience Center (Supercomputer Center) of Tohoku University. In 2012-2016, he was a member of Education and Research Council of Tohoku University. His research interests include high-performance computer architectures, supercomputer systems, and their applications. He received the B.E. Degree in Communication Engineering, and the M.E. and D.E. Degrees in Information Engineering from Tohoku University. He is a senior member of IEEE CS, and a member of ACM, IEICE and IPSJ. He received 2017 Minister of Education Award in the Field of Computer Science and received 2018 Minister of Education Award in the field of Science and Engineering.